Wanderings in South Goa. - Ghumakkar - Inspiring travel experiences. It was the summer of 2012, and we were already in the second week of June. We were going to be spending the next five days in this tropical paradise called Goa. We were praying for the rains, as there seemed to be not enough of it, and without the rains Goa becomes more like a greenhouse in summer. The best time to visit Goa is from November to March, which is also the Christmas, New Year and Carnival time. During these months you have all the beach activities, all night parties, and colourful festivities to witness. 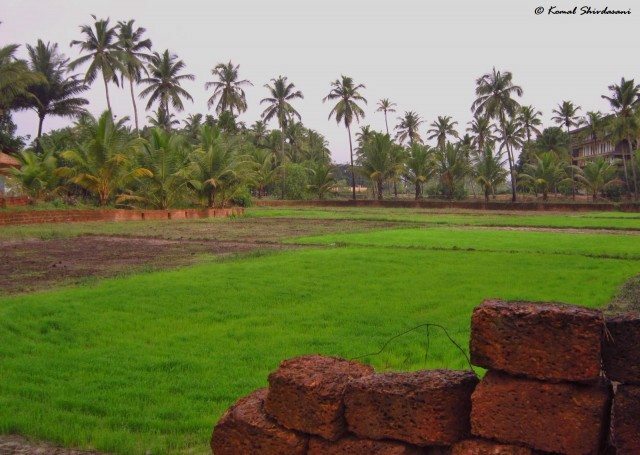 But we also like coming to Goa to welcome the monsoons and enjoy the verdant green countryside which Goa is so famous for. 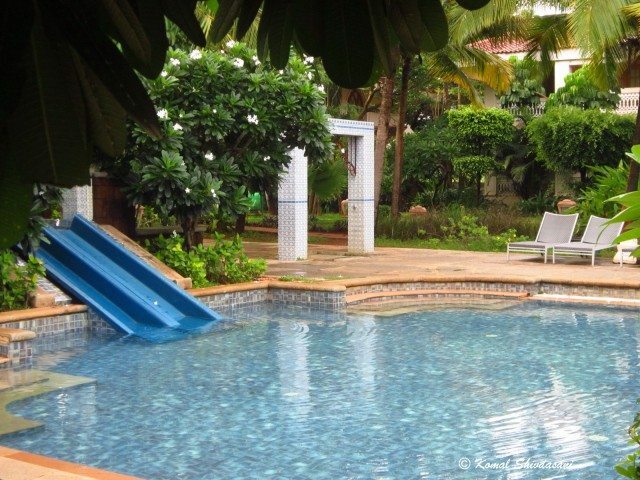 We stayed at the Club Mahindra Resort at Varca Beach in South Goa. 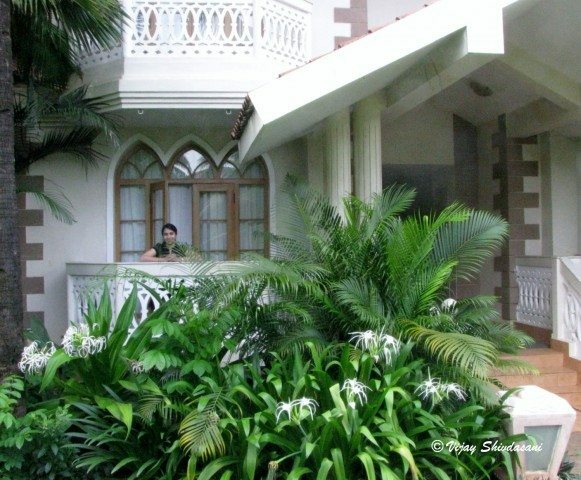 This resort has air-conditioned rooms set in Goan style villas spread out over a beautifully landscaped area. There are two swimming pools, a health spa and gym, a souvenir shop, as well as an activity centre with indoor games and internet. 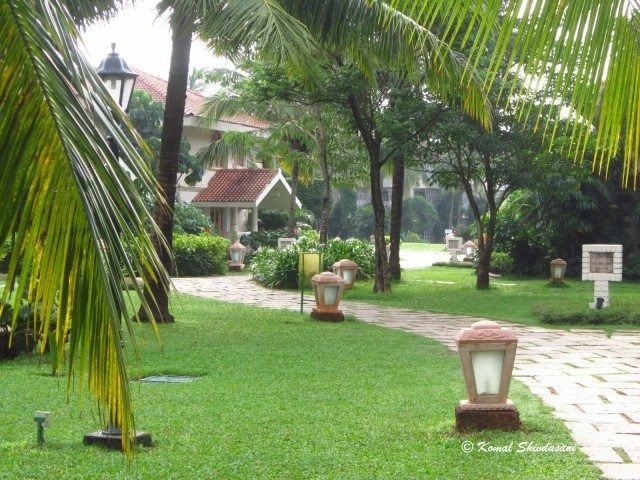 Club Mahindra Varca Beach Resort in South Goa. In the evening the management invited all the new guests for an orientation meeting over high tea. After that we went exploring by walking around the resort grounds, and out onto Varca beach. In this season it is not safe to swim in the sea, so we would have to enjoy swimming only in the resort pools. The swimming pools were quite large and well maintained. The one near the reception area was called the “Palm Grove Pool” and the second one towards the beach was called the “Sunset Pool”. The spa, gym and activity centre are adjacent to this pool, and if all the exercise gives you an appetite, then there is a snack bar nearby too. 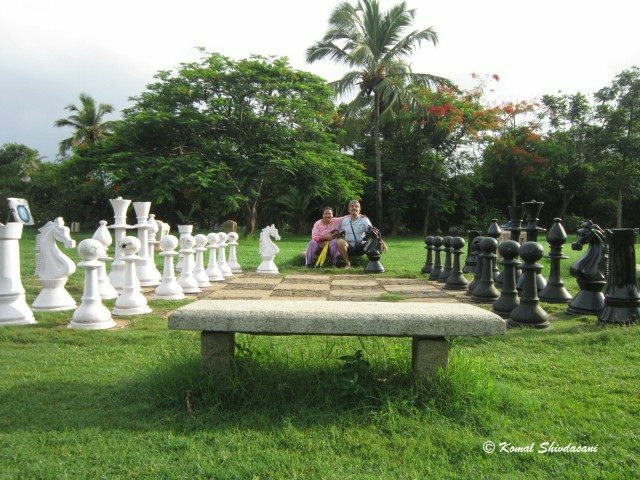 There is a giant chess set in one of the lawns of the resort. So if you want to have a combination of mental and physical excercise you can play a game on the giant chessboard. The beach is just outside the resort, and we had to climb a small sand dune with steps to get a view of the beach and the Arabian sea. 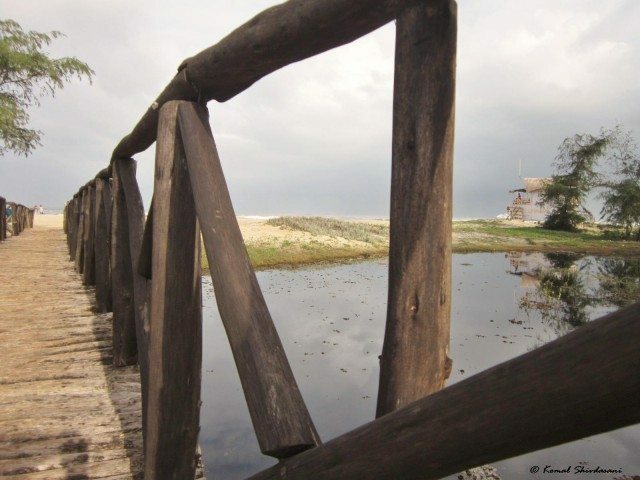 Then we crossed a wooden bridge and we were on the beach. 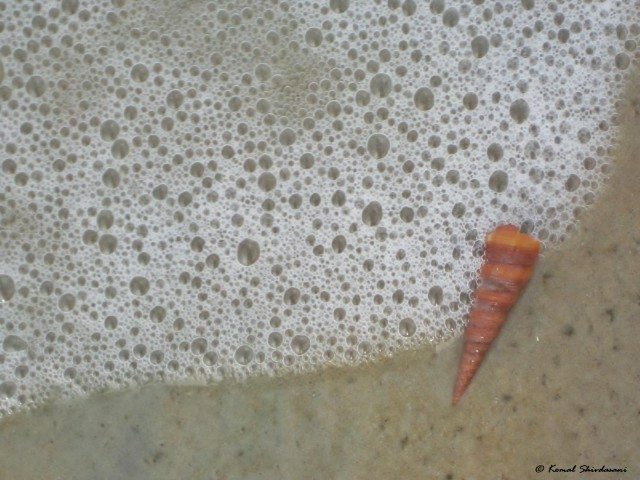 There were quite a few people on the beach, and in the water, but since the sea becomes quite rough in the monsoons it is dangerous to venture out too far. Nevertheless, the holiday crowd from the nearby resorts were enjoying an evening walk along the beach, and venturing knee deep into the water to greet the incoming waves. We decided to do likewise, and this became our daily morning and evening ritual for the next five days. It felt wonderful to have the waves come and caress your feet. We would take off our footwear at the bridge and walk in the soft sand till we reached the waterline. Then we could feel the foaming waves come upto our ankles and sometimes upto our knees and then slowly recede back into the sea. The sand at the waterline was quite firm and allowed us to walk quite easily, whereas if we tried to walk in the water or dry sand then our feet would sink into the sand making walking difficult. South Goa is one of the two districts of Goa which stretches from Mormugao and Vasco Da Gama down to the tiny and secluded beach of Polem in the Canacona taluka. On the eastern side of the district is the Sahyadri mountain range also known as the Western Ghats. So on the western side you have a long string of beaches starting with Bogmalo, Velsao, Arossim, Utorda, Majorda, Betalbatim, Colva, Benaulim, Varca, Fatrade, and Mobor-Cavelossim. 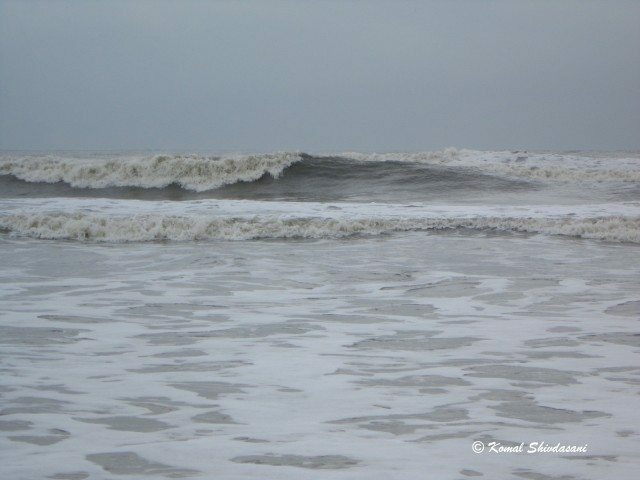 At Mobor the long stretch of continuous beaches is broken by the River Sal entering the Arabian Sea. 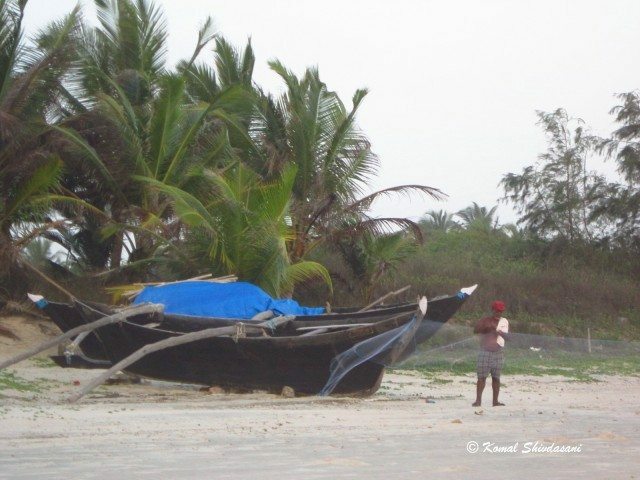 Further south are the beaches of Betul, Agonda, Palolem, Patnem, Rajbag, Galgibag and finally Polem. Just after Betul the beaches give way to a rocky outcrop which rises up to become a cliff, and on the top of this cliff is an ancient ruined fort known as Cabo Da Rama. The fantastic views one gets from the ramparts of this fort are well worth taking the trouble to reach this almost inaccessible place in Goa. The uncrowded beaches are not the only attractions of South Goa. 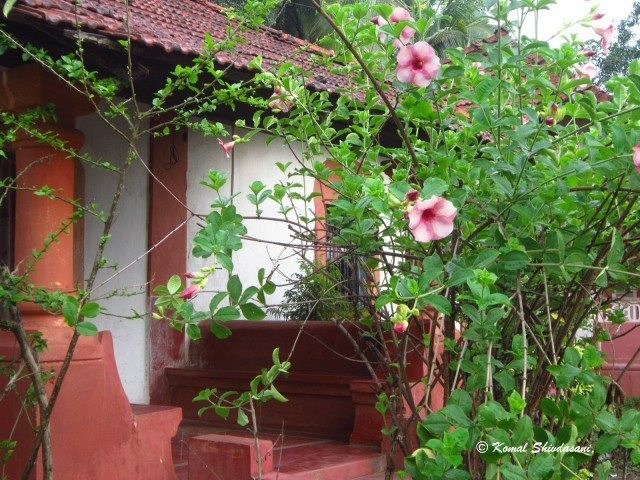 As you drive inland from Madgaon, which is the main market city of Goa as well as the district headquarters of Salcete taluka, you will find many picturesque villages with colonial era country houses built during the Portugese rule. 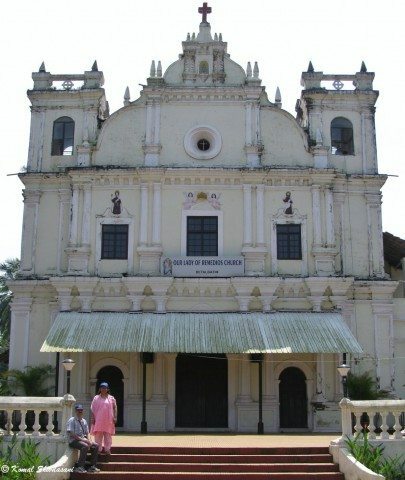 Most of the well known Hindu temples of Goa are concentrated in the Ponda taluka in North Goa. However there is one very beautiful ancient temple in the Quepem taluka of South Goa. 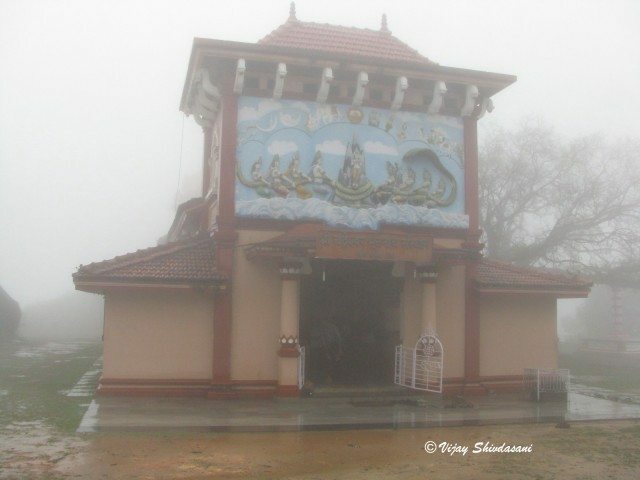 This is the Shri Chandreshwar Temple on a 350 metre high hill at Paroda. Inside there is a Shivlinga which is so located that it receives the moonlight on every full moon night, hence it’s name. The temple commands a panoramic view of the landscape. 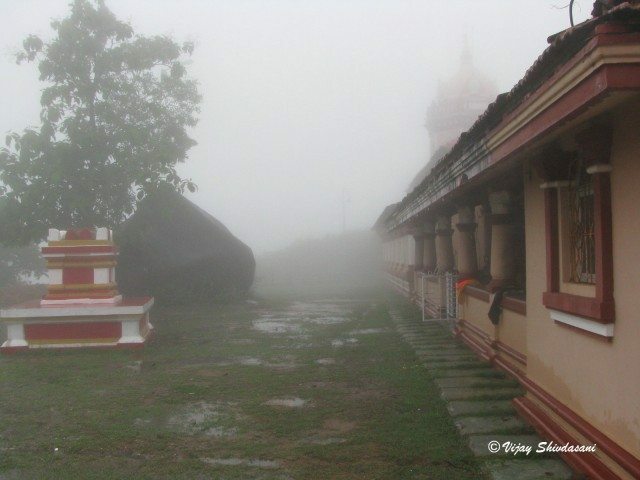 However, we happened to visit it on a rainy day and the temple was shrouded in mist, which made it look even more enchanting. There are also two wildlife sanctuaries in South Goa; the Bhagwan Mahaveer Sanctuary near the Karnataka border and the Cotigao Sanctuary in Canacona taluka. The Dudhsagar waterfalls, also near the Karnataka border is one of the highest and most beautiful waterfalls in India. One of the most important ingredients for an enjoyable holiday in Goa is Goan food. Good food is at the heart of everyday life in Goa. 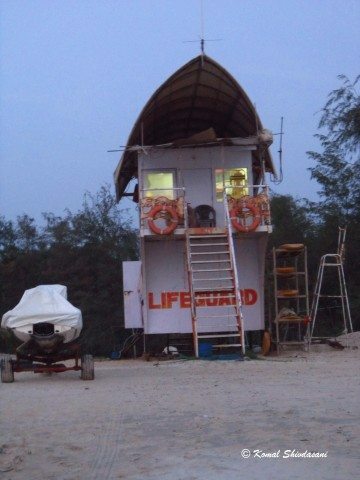 If you have not eaten at a ‘beach shack’ in Goa then you have not really ‘been there done that’. 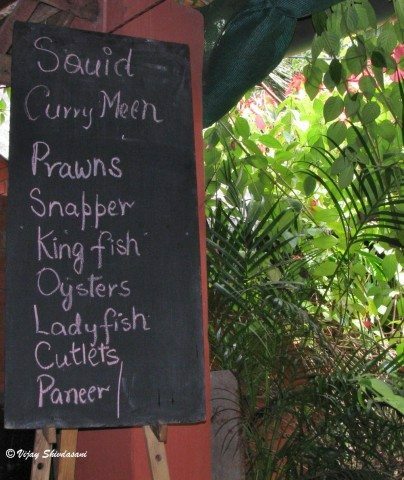 Variety of seafood at a Goan restaurant. 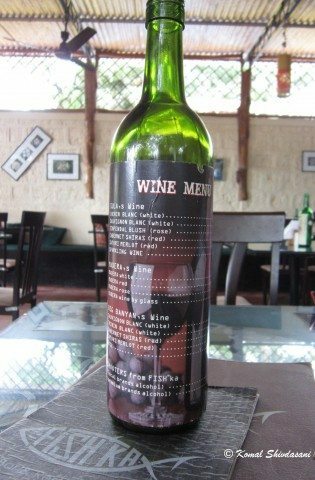 You are really spoilt for choice when it comes to restaurants in Goa. 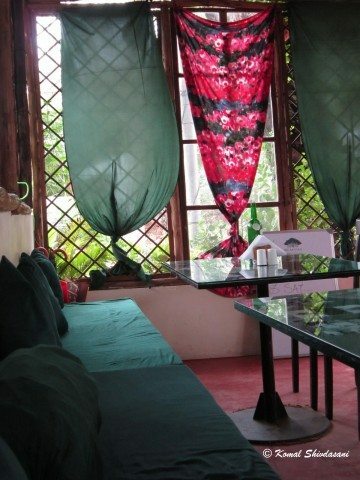 Besides the beach shacks, where you can sit on the sands and gaze out at the sea, sipping on a drink, while waiting an hour or two for your meal to arrive, there are many restaurants inland which also serve excellent food at very reasonable rates. There is a fusion of East and West, Portugese and Indian, meat and vegetables, which makes Goan cuisine unique. Coconut is used liberally, along with other Indian spices in the cooking. ‘Fish curry rice’ is the most common food and available virtually in every restaurant. The different types of seafood on offer in Goa includes pomfret, kingfish, ladyfish, mackerel, tuna, shark, crab, prawn, lobster, squid and mussels. Chicken, pork, mutton and beef dishes are also on offer at all the restaurants, cooked in the popular Goan flavours such as vindaloo, balchao, recheado, xhacuti and caldin. We had already planned that we would include at least one meal out at a shack or restaurant in our daily sight-seeing itinerary. One precaution we always took was to carry our own drinking water if we did not want to order a drink, or pay for a bottle of branded mineral water. On the first day we decided to go to Benaulim beach shack for lunch. 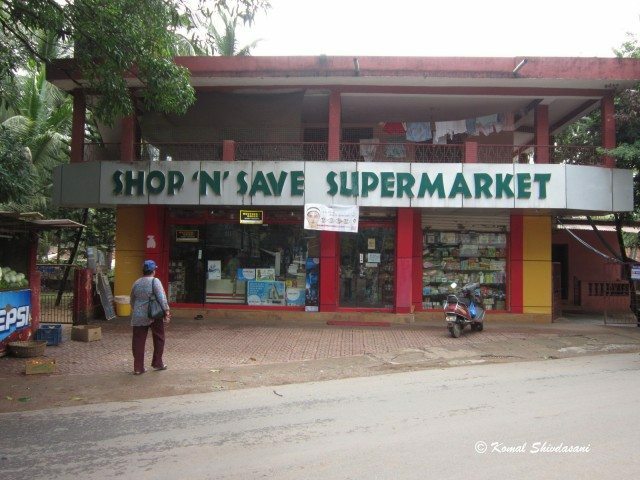 We stopped for a while near Benaulim and bought some groceries from ‘Shop n Save’ supermarket. 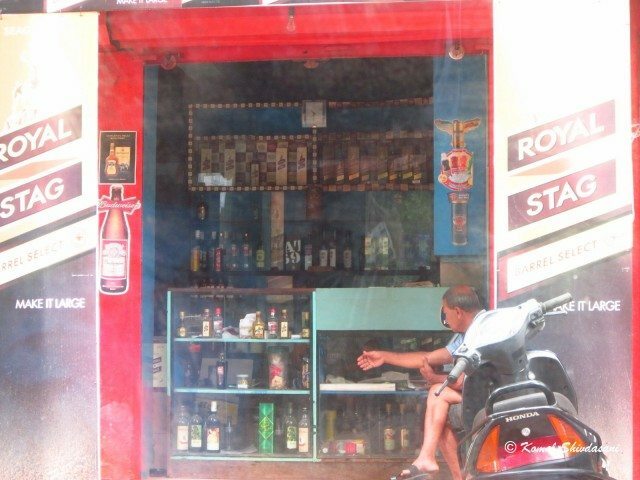 Komal clicked a snap of a typical Goan wine shop from the car. Make it Large! Have a Blast! 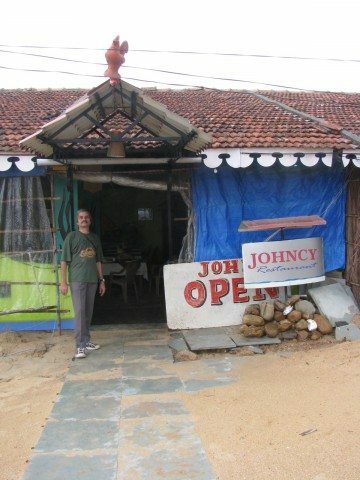 Finally we reached Johncy’s beach shack on Benaulim beach and settled down for lunch. Next day we decided to stop for lunch at Fish’ka restaurant at Betalbatim, since Martin’s Corner was already quite crowded. 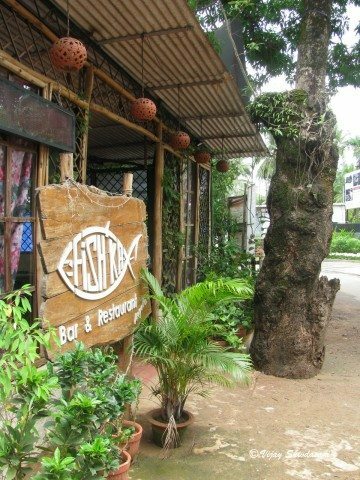 Fish’ka is located just across the road from hotel ‘Alila Diwa Goa’. 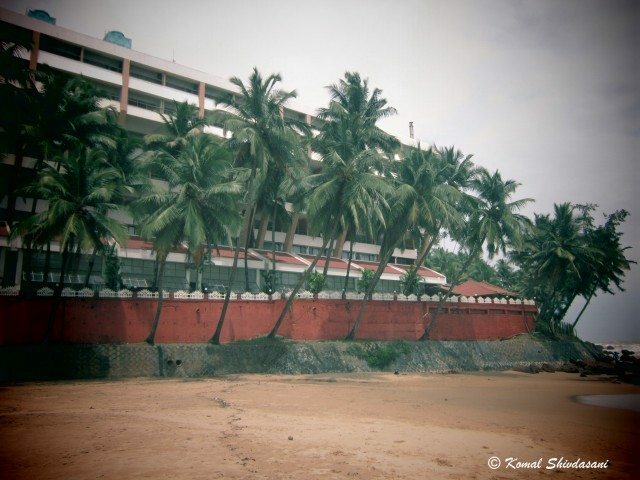 We had dined at Martin’s Corner on an earlier trip and I had reviewed it in my earlier post, A Goan Monsoon. 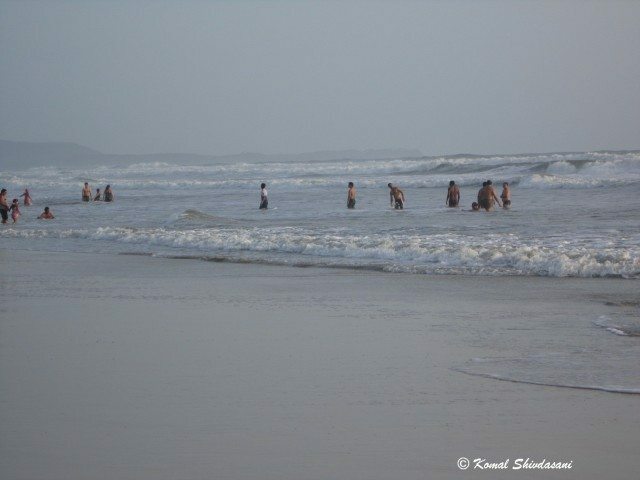 In the evening we were back on Varca beach and Komal took some more snaps of the beach, the waves and the sunset. frothing and foaming waters of the angry sea. The next morning, after a quick breakfast of Kellogg’s muesli and cold milk, we got ready to go for a drive along the coastal road right up to the industrial city of Vasco Da Gama. It was a cloudy day with intermittent showers and the drive along the narrow coastal road was very scenic and pleasant. 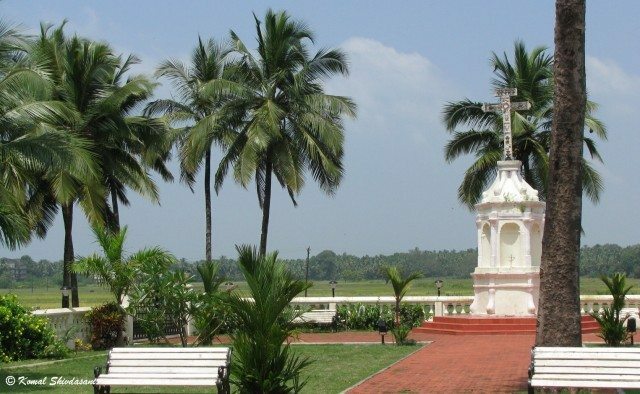 We would pass small cottages surrounded with tall coconut trees and other plants and creepers, many small chapels and some large churches along the way, and open paddy fields and coconut groves. We reached Bogmalo beach around lunchtime and settled down to have lunch at the ‘Full Moon’ restaurant near the beach. 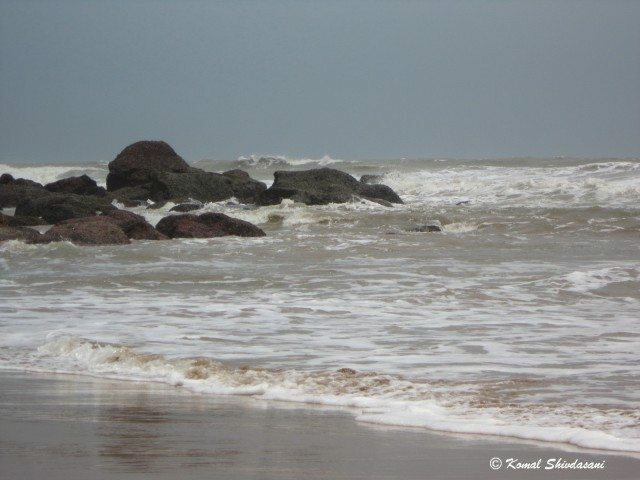 Bogmalo is the first beach of the South Goa stretch, and is very near to Dabolim Airport. 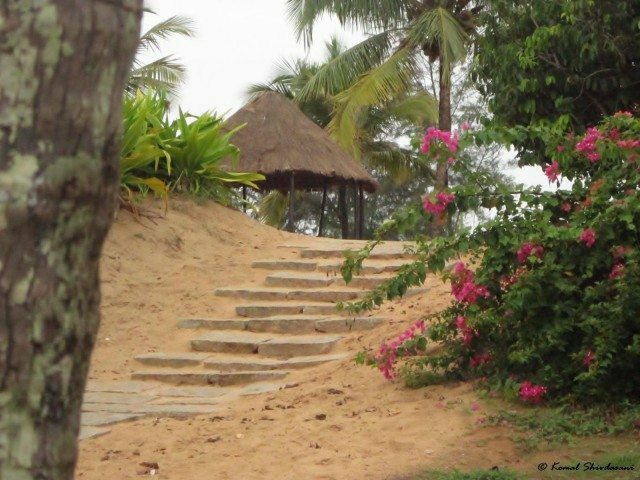 The Bogmalo Beach Resort towers over the beach. We carried on further till we reached the city of Vasco Da Gama. 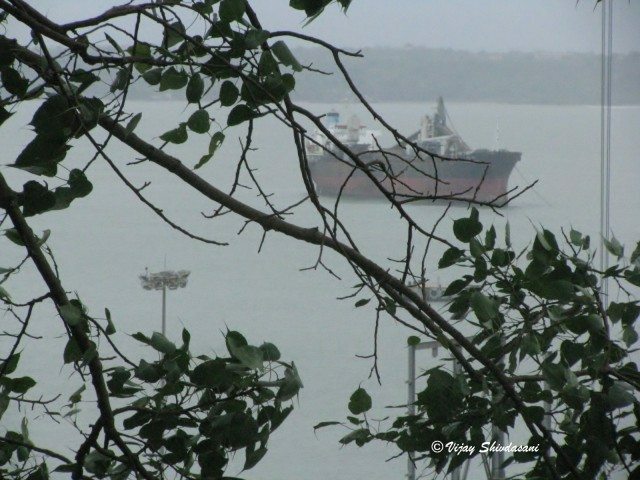 Vasco is the most commercialised city of Goa,with a lot of industrial activity and rows of apartment blocks along the main roads, and is home to the Mormugao Port, which is one of the best natural harbours in India. We drove up to the ‘Pilot Point’ from where we could get a good view of the harbour and the city. From here we took some quick snaps and were soon on our way back to Varca, 40 km south. On the way back, near the village of Velsao, I found the scenery so mesmerising that I just had to stop and get out of the car to take some snaps. I took some photos of the chapel and the lush green countryside all around. Cuelim hill with Three Kings Chapel on top. I clicked the last photo (above) without any knowledge of the exact location. It was only while geo-tagging it later that I found out the name of the hill and the chapel on top. 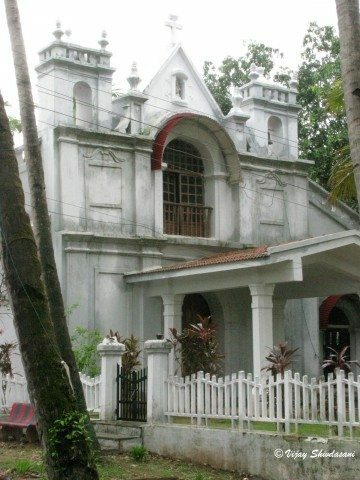 It is the Three Kings Church or Chapel on Cuelim hill, and some people believe it to be haunted by the spirits of the three kings. At Batalbatim we stopped at the ‘Our Lady of Remedios Church’ for a while. We picked up some patties at the local bakery and were back in Varca by 7 pm. 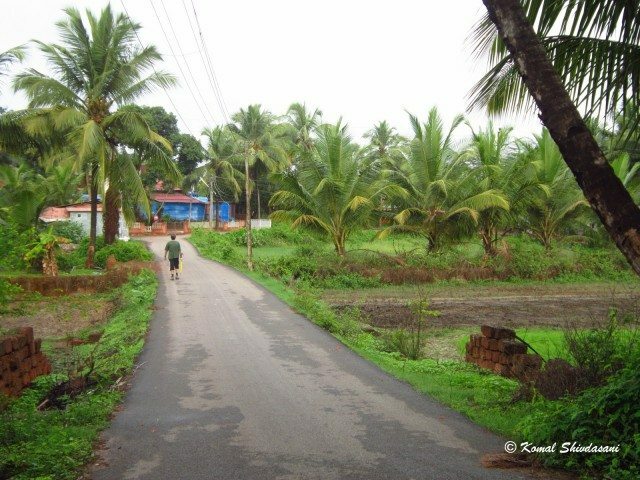 On the last morning in Goa we decided to take a walk into the village and capture some more images of the Goan countryside. If you happen to visit Goa without your own transport, then hiring a two-wheeler from a local is a good option for getting around. Auto rickshaws are not easily available except in the major towns, and cabs can be very expensive to hire for short trips. Swimming in the sea, boat rides, dolphin spotting trips and para-gliding were some of the activities which we missed during the rainy season. Even so, we had an enjoyable vacation and were sad to depart from this land of fun, food and frolic. 1. To give you a little background, we have already had 8 holidays in Goa ex North India and have been going to South Goa between 24 Dec – 7 Jan every year for the last 5 years. It is an annual ritual for us and every visit to Goa excites us even more. 2. Now on to your Article. It is one of the BEST I have ever come across. It is well researched, it is most exhaustive, informative and painstakingly done with some �very local flavour catching photographs�. You definitely need to be complemented even more since the focus of the photographs is NOT on you and your family’s faces. 3. Since me and my wife are avid travellers having visited 24 countries in the last 6 years including 4 Royal Caribbean Cruises, I also write; though now only at times for Ghumakkar and Trip Advisor. The pace has slowed down since the effort to produce an Article the way you have produced takes a whole lot of time and effort. Then of-course is always the nagging doubt in the back of the mind whether anyone will read it or not. 4. Anyway, my heartfelt Congrats to you for such a splendid effort. @ Sandeep – Long time Sir. Hope to read something from you soon enough. @ Vijay – Brilliant read. As if the series of mouth-watering snaps were not enough, you continued the ride to make us familiar with Chapels, Beaches and a LOT of food joints. 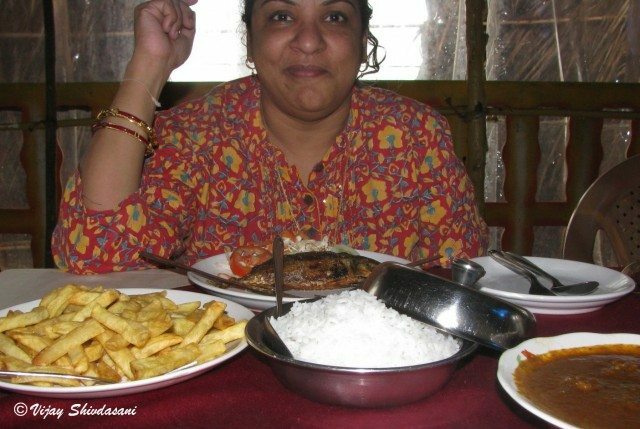 As you know, I was in Konkan for a week in Aug 2012 and thoroughly enjoyed the Konkani food (form sol kadi to fishes to what not). After reading this log, I am singing Goa Goa Goa. Please pass on my thanks to Komal for the stunning photographs. Each and every part of the post was pleasant to read and watch. Photos were marvelous , Which camera do you use ? Only thing I felt from my point of view was that if the post was divided into two with more description. Overall It was a fantastic post. Vijay sir, wonderful post with beautiful snaps. Memories of my own Goa sojourns came flooding back. 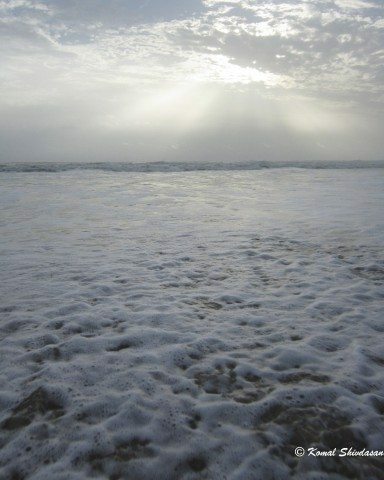 Great post, Vijay, immensely readable and your pictures have captured the essence of Goa. Goa is a place about which a lot has been written. 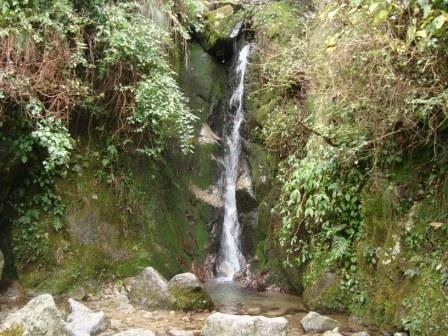 Yet, there is a freshness to your description and it felt like discovering a new place. However, I feel that it was a wee bit too long; it could have been split into 2 instalments. ??? ???? ?? ???? ??? ???? ?? ???? ?? ???? ???? ?? ???? ??? ?? ???? ?? ?????? ?? ??? ??? ???? ?? ????? ???? ??? ???? ??? ?? ?? ?? ???? ??? ??? ?? ???? ?? ???? ?? ????? ?? ?? ?? ???? ???? ? beautiful post with some great photographs. Very nice description and good photos. Fish Pakora look like bread Pakora. Rice and fish curry. Is they have veggie curry also so everyone can enjoy. Like to visit there and take a ride on water scooter. Thanks for share of journey. Your post & photographs forced me to visit Goa once again. 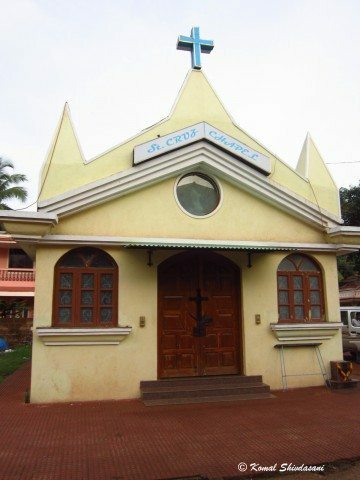 After seeing pics of city and chapels, I realized what I had missed in my last 3 trips of Goa. Fortunately I had seen Madgoan city in my recent visit but not like the way you had. Sea food & wine shop… Goa calling. Hi Sandeep, Nandan, Vishal, Amitava, Venkatt, Narayan, Manu, Ashok, Surinder and Girdhar. Thank you for reading and appreciating the post and photos. I just returned from a trip yesterday and was overwhelmed to see the response. @Sandeep – I was indeed flattered to receive the superlative and special compliments from a well travelled person such as you. Yes, I did put in some extra efforts and research while writing the log, but the photographs are all original, taken either by me or my daughter Komal, even though none of us may have ‘starred’ in it. Hope to have some more posts from you too, we would definitely like to read it. 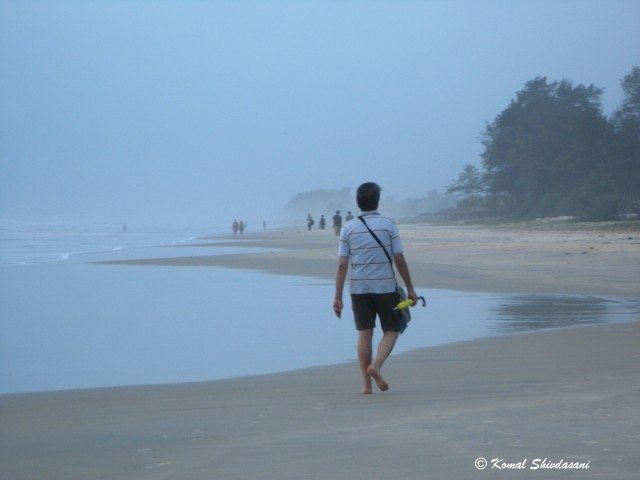 @Nandan – You were so near yet so far away, Goa is just an hour’s drive from Tarkarli. Komal was happy to receive your praise. @Vishal – Thanks for your compliments. Both of us used Canon Powershots, but different models. Noted your suggestion. @Amitava, Ashok & Venkatt – Thanks for reading and liking the post and photos. @Narayan – Thanks for your appreciation. There were more photographs, hence the post seems longer. 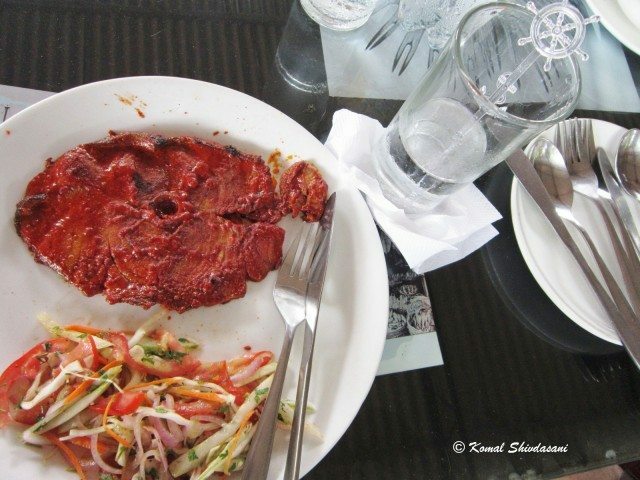 @Manu – If the photos made your mouth water, then you must visit Goa for the aromas and taste of the good food. 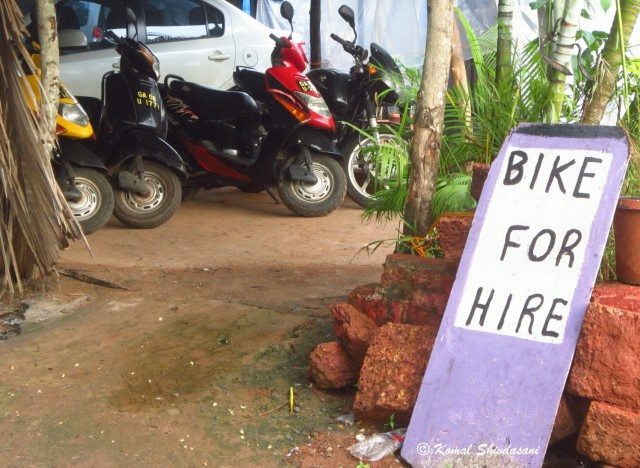 A bottle of feni can be had for around Rs.100, and bikes are available for hire for about Rs.300 per day. 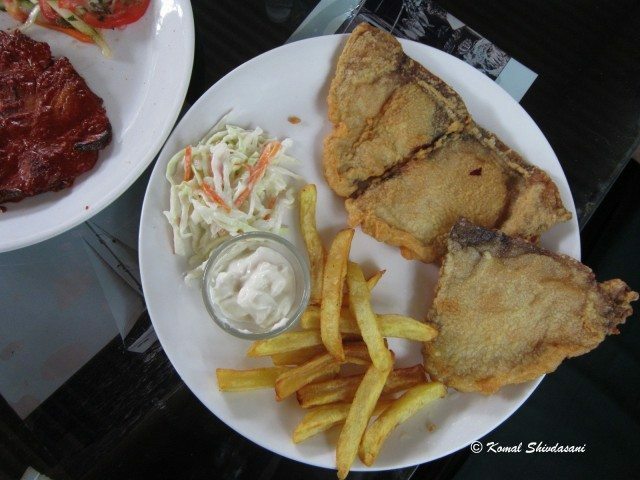 @Surinder – Of course, veg food is also available in Goa. But even some Goan Brahmins have become fish eaters, and consider it to be vegetarian food! Water scooter rides are not available in rainy season, from June to September. 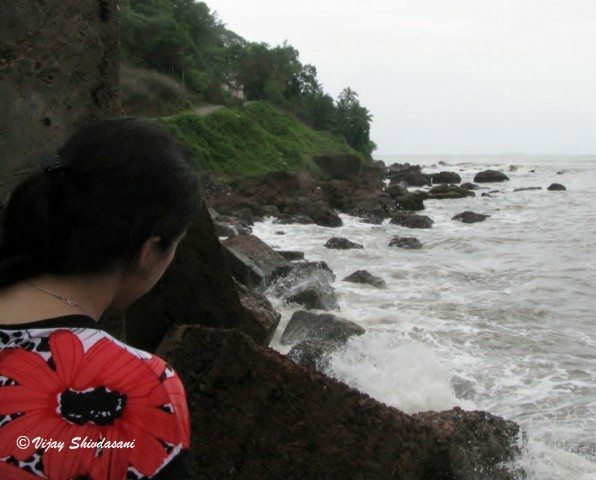 @Girdhar – More you visit Goa, more you enjoy! 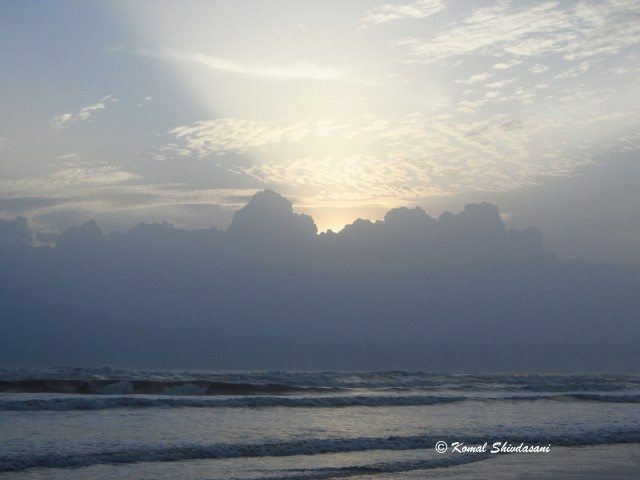 Goa has much to offer, to the city slicker as well as the nature lover. Thanks Vijay, for your kind words, I will go there in January, mine friend want me to ride on water scooter so for sooter ride I choose this place. 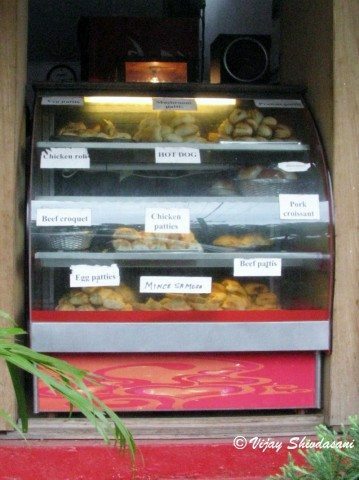 As you mentioned about Goan Brahmins have become fish eaters, when I was new in this city I ate Onion rolls and Patoto’s fries. But later I come to know shops use same oil for beef, fish, chicken and fries. Kniefs table are same for veggie and non-veg. Now I just took two slice of bread with me, butter and other stuff not prefer due to health. The comment about the photographs. I genuinely wished to laud you for what I have said. No question what-so-ever of any hidden meaning or doubting the authenticity of the photos. Old Anchor, Dalmia Resorts, Cavelossim ( 0832 287 1180 )which has a beautiful beach next to it is managed by Rajasthanis and is / was a Pure Veggie place atleast till Jan 2012. Going through your post brings back some of them. Nice pics. Food pics are pretty enticing. Thanks for reading and liking the post and pics. 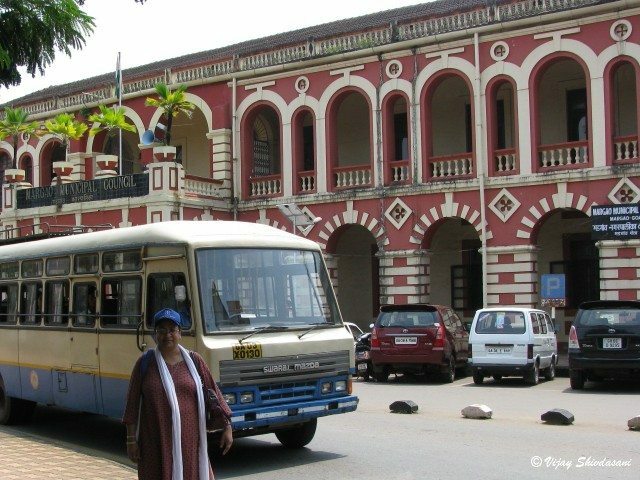 �Rarity of Beggars in Goa � � True. 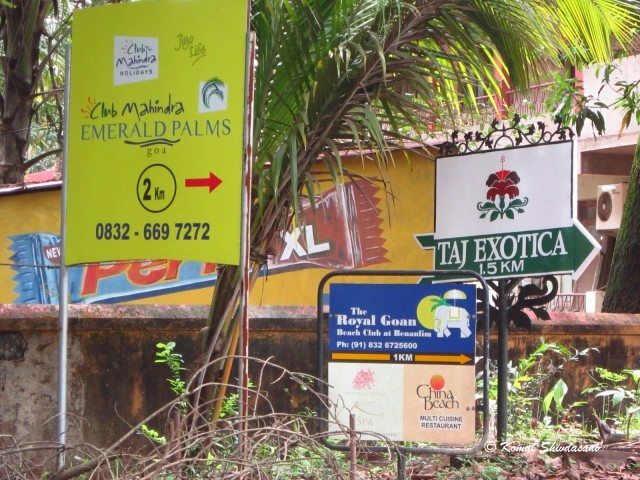 � Alcoholics in Goa� � Not too many. How-ever, their number must be exceeding that of Beggars. I must narrate an experience which happened with us on 1 Jan 1991 afternoon in Madgaon. We were going some-where in our car and asked a suited � booted gentleman on the road about the directions to the place we were going. The car was parked just next to the Gentleman and instead of replying to us, he kept giving us most disapproving looks. The question was repeated � yet no reply, and the disapproving looks continued. He is �HAPPY�, so we thought . My wife then requested � Sir, can your help us by telling us the way to the �..( the place we were going to). �Sir, we are from Haryana�. � Sir, thank you and a Very Happy New Year once again�. The readers might like to remember it. 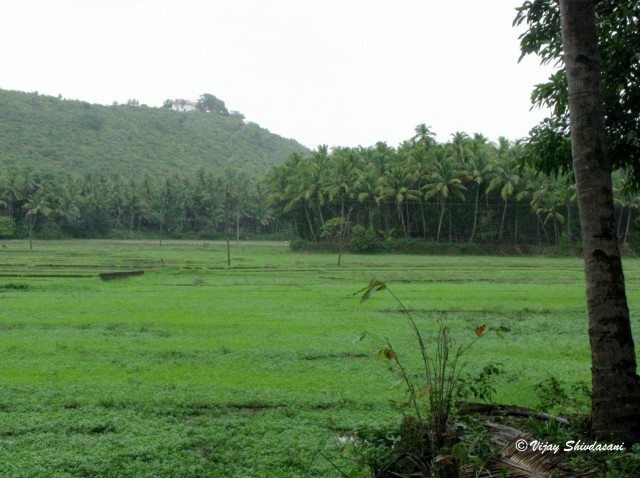 Goa is looking so green in Monsoons. 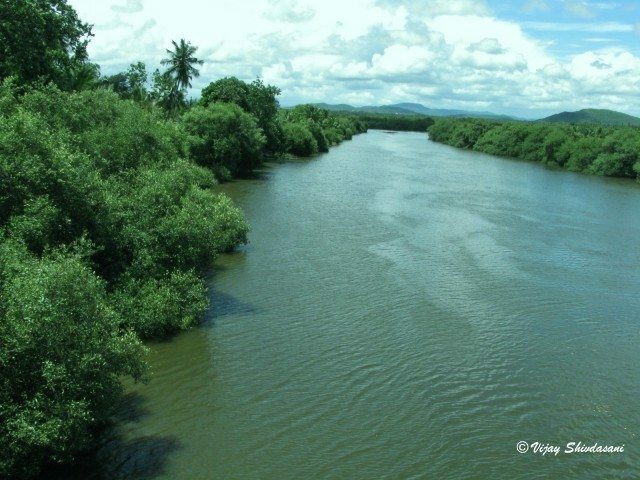 Sal river photo I liked very much. Thanks for sharing your experience with great information. Thanks for reading and appreciating. Goa is always green but more so in the monsoons. Your decription of your travels are very detailed and informative. Thanks a lot. The photographs alongwith the description also add to the overall experience. Reading your posts are a great experience. I had a query: I am planning to go to South Goa in the first week of June from Pune. I will be going to Goa for the first time! I have got a lot of information of what to see and do from your detaited articles in this website. In your posts, you have mentioned 2 routes, one through Amboli and the other through Belgaum. Since you have travelled to Goa multiple times, which route will be preferable in your opinion? There were many more scenic places to visit around Dalhousie but for us, it was time to say Bye. We were in the car, climbing down from Dalhousie to Pathankot. Our mind full with the thoughts of Journey but one thing became clear, this beauty is impossible to explain through words so, just a piece of advice for all – Go visit Dalhousie.